Oh my gosh! I cannot believe it. This post popped up in my feed and I can barely contain my excitement! I miss this show so much. So. Much. You read that right. 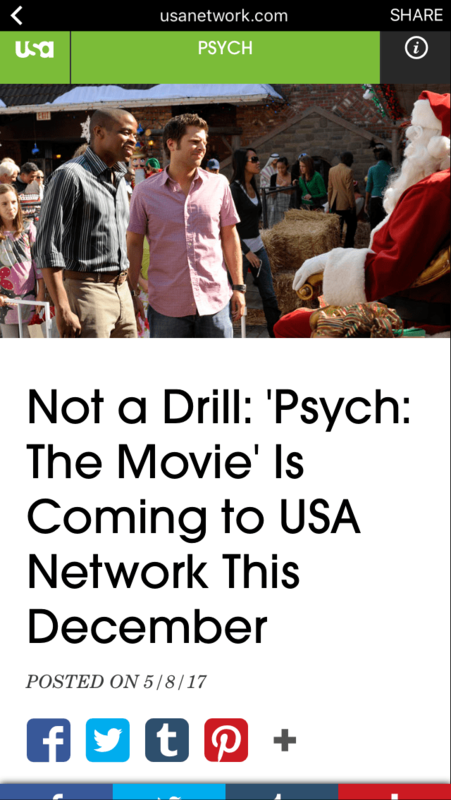 Psych fans are getting a movie. A movie! As the post mentions (which you can read here) it picks up three years after the show’s finale and we’ll see the core cast returning to reprise their roles (Shawn and Jules 4eva! Shawn and Gus BFFs!). We last saw these guys in 2014 with their series ending “The Break-up” which, as far as series-enders go, was perfect. It closed plot lines but left wiggle room for it never truly end, you know? And I’m sorry but I can never think about this show’s ending without mentioning the others. 2014 was a hard year for me, saying good-bye to theee of my most favorite shows ever!–Psych (2006-2014), White Collar (2009-2014), and Warehouse 13 (2009-2014). All in the same year. sniffs Gone. And I already said good-bye to two more favorites a few years earlier, Monk (2002-2009) and Eureka (2006-2012). But at least we Psych fans get this. A moment to “peek” at the gang three years later. For whatever reason, I’m not as scared of this revisit than I was with Gilmore Girls. I don’t know. I’ll tamper down my optimism just a teensy bit then. But still. So awesome!